YANGON—If you’ve been to Kayah State, Myanmar’s smallest state located on the eastern border, you’ve undoubtedly sipped at a cup or jar of traditional rice wine. Kayan rice wine, or khao yae, is drank by men, women and children alike in Kayah State on special occasions celebrating weddings, harvests and religious festivals. Sitting around a smoking fire in a wooden Kayan kitchen, sipping rice wine through a bamboo straw is a quintessentially Kayan experience for visitors to the state. So what is rice wine? 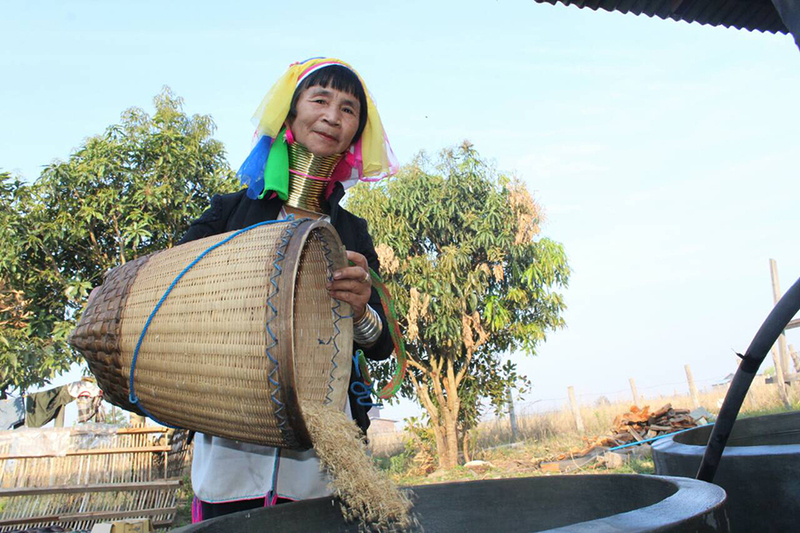 The traditional brew is made by mixing sticky rice, millet, natural yeast and water and steaming it before storing it in a large clay pot to fermented for around three weeks. The liquid turns light pink in color, is slightly fizzy and sweet with a lip-smacking tang. Though the exact alcohol content is unknown, the basic brew is thought to be around 17 to 18 percent alcohol and it gets stronger the longer it’s left to ferment. With Kayan New Year falling on Dec. 5, Yangon’s only Kayah food restaurant, Vista Do Rio, will hold a Kayan traditional rice wine festival this weekend, Nov. 17 and 18. No less than five types of rice wine can be sampled with a special Kayan food menu also available. To show appreciation for the customers’ support, one complimentary traditional dish will be served to each table. “We want to introduce the Kayan culture to the people. It is still hidden so I want to promote the culture, their food and the amazing chili and ingredients they grow there,” said Vista Do Rio owner and manager Ko Zay Yar Min. 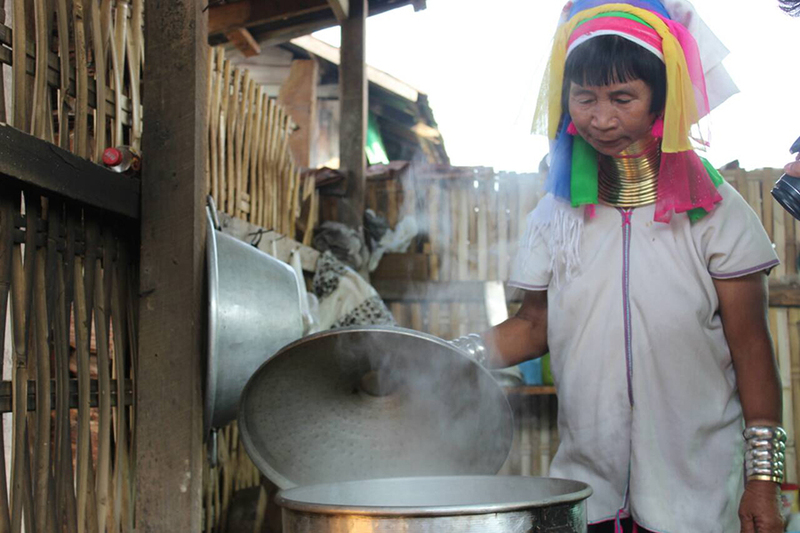 A video explaining the process of making rice wine will be projected and rumor has it that famous film director U Aung Ko Latt will be there for a screening of his award-winning film Kayan Beauties. Entertainment kicks off at 7pm. The rice wine at Vista Do Rio is made in Loikaw and batches are transported to Yangon every few days. 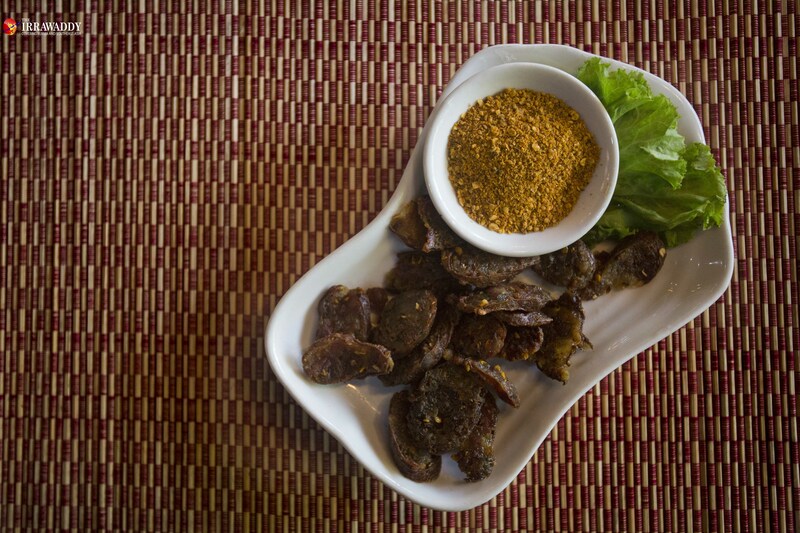 Ko Zay Yar Min, a Burmese man with an affinity for Kayan cuisine, carefully researched the wine-making process over a number of years and says it is best sipped slowly and accompanied by snacks. The first of the five rice wines on offer is the original khao yae brew which is a permanent fixture on the menu at Visto Do Rio. It’s made from the first batch of wine taken from the rice-millet mixture usually after three weeks of fermentation. 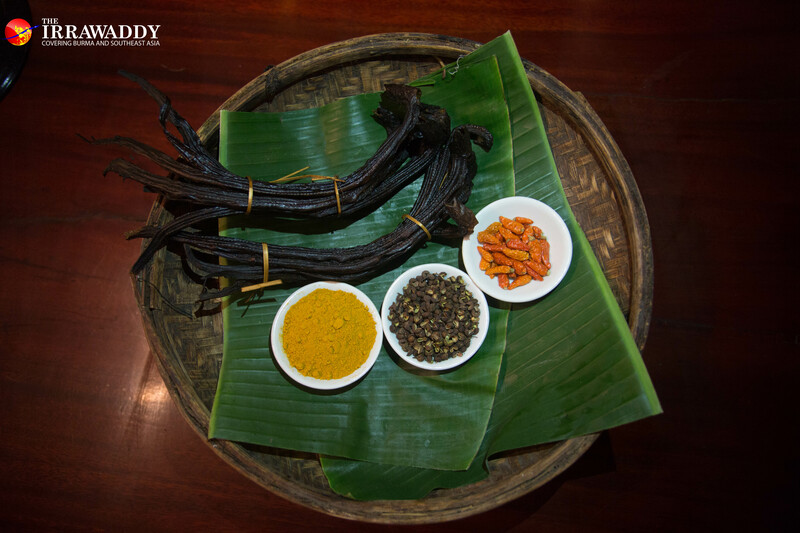 The taste is sweet and mildly fruity with a tangy aftertaste and leaves a heat in the throat. Khao bu (hot rice wine) is a lighter version of the original wine which is mixed with hot water to give a very different, sweeter flavor which is particularly popular during chilly Kayah winters. Khao phyu, or white rice wine, is fermented for only 18 days using a different type of rice. This has a tart flavor and stays fresh for only three or four days. Htel Lei rice wine, named after the village it originates from, has a rounder, honey-like flavor. 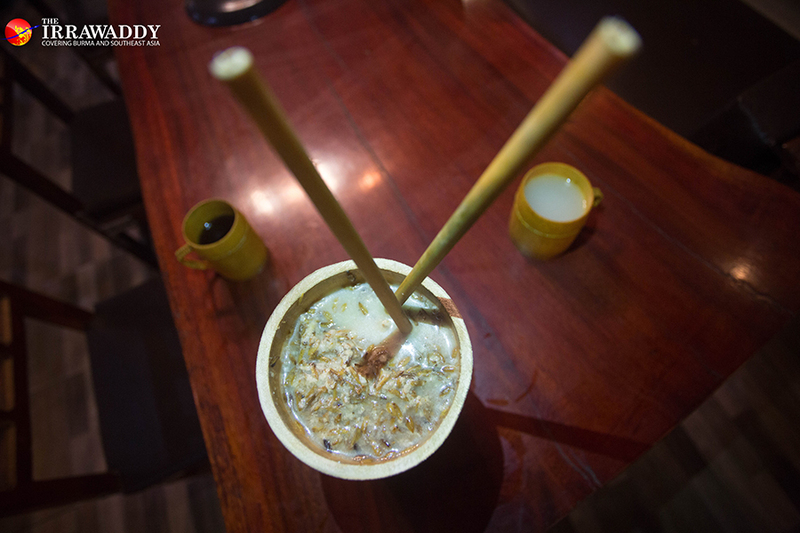 Sote khao is fun to share with friends—the rice wine is served in a tall bamboo cup and sipped through bamboo straws. There are three different layers of flavor with the top being warm, tangy and dry, the middle growing more tart and the bottom layer a different, earthy flavor. The concept for Vista Do Rio came to Ko Zay Yar Min when his wife returned from a trip to Kayah with a gift of traditional pork sausage. He loved it so much, he was inspired to travel there to discover more Kayan food. Ko Zay Yar Min began a long, slow process of traveling through rural Kayah State learning recipes from villagers, trekking for days at a time and camping along the way, even joining hunters on multiple-day trips into the jungle. “I stayed with the villagers and ate together with them and then went to the kitchen to see how they cook. I asked them to teach me and the next day I would cook it for them and ask them how is the taste,” said Ko Zay Yar Min. In 2017 he put the best Kayan recipes onto the menu of his new restaurant which sits in an informally landscaped garden on the river bank in Thuwana Township. Food-wise, unmissable dishes at Vista Do Rio include the original Kayah pork sausage, tantalizing beef cooked in bamboo, fresh Kayan cucumber salad and Spring Taste which is pork ribs, red silk cotton flower and soya bean paste. For the rice wine festival, a special menu of dishes to pair with the rice wine is available and includes smoked eel with fried leek root, pan-fried taro and pounded beef, all of which go down very well with the khao yae.